This is our top of the line, outdoor kayak and SUP storage rack. Made of stainless steel and customizable with straight and angled arms to fit your configuration of kayaks and paddleboards, this rack is built to stand up to serious outdoor exposure. The heck with lugging your paddleboards and kayaks around every time you want to use them. Get this rack and leave them at the water's edge. Customize it to fit up to 5 paddleboards, up to 5 kayaks, or a mix of both. How is it secured to the ground? This rack is made to be bolted to your dock, deck, or any other floor space using included mounting hardware. The entire rack sits over your dock or floor space. How many kayaks and SUPs can it hold? Holds up to 5 paddleboards, 5 kayaks, or a mix of both. Select your mix of straight and angled rack arms to fit your kayaks and SUPs. If more storage is required visit our Double Sided SUP & Kayak Rack listing. It's the same rack, but double sided for twice the storage. Rack Arms: Made of stainless steel and include stainless steel installation fasteners. All arms come as pairs (set of 2). Each arm's tip has a tie down point to use to secure your kayaks or SUPs (tie downs not included). UV resistant foam padding covers the arms to protect your kayaks and SUPs when racking and unracking. Note that the base of the rack serves as 1 straight storage arm. Straight Arms: best suited for kayak storage, are 36" long. Can add up to 4 sets of straight arms in addition to the base straight arm. Angled Arms: best suited for SUP storage, holding your paddleboards on an angle, are 20-5/8" long. Can add up to 4 sets of angled arms in addition to the base straight arm. For additional "Design Your Own" listings, take a look at our Customizable SUP & Kayak Freestanding Rack or the "Build Your Own" rack. A little pricey with added legs to hold boards. But a very high-quality rack. Looks terrific! Wish it came with board ties as well. Only took my handyman an hour to secure to the dock. Very sturdy and should hold up well to the salt water exposure. SUP rack works and looks great. Many people stop and ask us where we got it from. 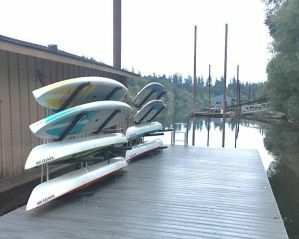 We have three kayaks on the rack so far, and plan to add two paddle boards. Over the weekend, while we were away, we have a Nor'Eastern go through with 30+ MPH winds. We have each kayak secured with one cord only. The rack is mounted to our floating dock and we are on a larger river just off the Atlantic Ocean. The rack held up perfectly. All kayaks are safe and secure, and the rack is still on the floating dock solid, despite what must have been huge waves! I have built different storage for my 2 Kayaks and 2 SUP's which held them o.k.. Recently having built a new patio I decided to look for something more professional and sturdy. This product was the perfect choice for looks, function and I would expect longevity. It is very well made. I also enjoyed the nice people at Storeyourboard.com who assisted me. The overall quality of the rack seems very good but he way it is mounted on the dock seems a bit flimsy and we might need to add steel wires in order to reinforce the stability. Also two boxes of the arms arrived with opened ends and the bolts which are just loose inside the box were missing. Customer service still has not acknowledged my requests to send additional bolts. I think my boathouse and dock just got really tidy! Will this hold five inflatable boards if using the angled arms? Can you recommend a solution to store and lock kayaks and paddleboards securely outside? Thank you. 2-3 paddle boards and 2 kayaks. There are a couple ways to secure your boards and kayaks, that can be used in conjunction with this SUP/Kayak rack. For your SUPs, we would recommend SUP dock locks, which is a cable and locking system, that attaches to either your SUP's leash plug or fin box, and you can order extra jaw clamps with the main cable, so that you can use one dock lock cable to secure several boards at once. There is also a kayak dock lock;the kayak jaw-clamps attach to 1/2" or 3/4" kayak accessory rails. Some other locking system alternatives for kayaks can be found here, and include some locking tie-down straps. Using something like the dock locks though is a versatile way to secure your boards to the rack and/or to the wall, or a fence or other stationary item. What is the height clearance for both kayaks (assuming the bottom two spaces are designed for kayaks and the top 3 for sups)? Our stainless steel SUP/Kayak rack is an adjustable system, so you can place the arms (either SUP or Kayak arms) at many different levels. If you go with 4 arms, with the lower two levels being for your kayaks, you would probably have about 17.5 or so inches for your kayaks, but you could probably get more inches by placing the SUP levels closer together if your SUPs aren't that thick. Also, the SUP arms on this system angle upwards, so that gives you a little extra clearance room below the angled arms. I'm looking to store a canoe, two kayaks and a sup. Wondering how far apart the arms are and if the space could be adjusted big enough for my canoe to fit on the bottom set of arms? It is a 17' Grumman aluminum. Also, I would probably go with all straight arms and put the sup on the top set so wonder how accessible that would be in terms of height above the dock? This rack system is adjustable on where you can set either type of arm (straight or angled) and has multiple places to set the arms, but how well a large canoe will fit on it, along with the kayaks & SUPs may be a question-mark. It really would depend on how deep your Grumman is. It *might* be do-able; but the length of the canoe could be an issue if not on the bottom level, as the rack is about 5 1/2 feet long, so you will have quite a bit of canoe on either end (about 6 feet on either side of the rack). To answer your other question, on storing the SUP on the top set (using a straight set of arms), the rack itself is about 69" tall - so about 5' tall; so the top rung of arms will be near to the top of that height, for reference. Can the rack stand alone on a level concrete or grass surface? Or is it adaptable? I don't have a dock but need an salt-water-proof marine grade rack for 5 SUP boards. This SUP/Kayak rack does need to be bolted down to a surface; it does not work as a freestanding rack. For your area, where you need marine-grade materials, to hold that many boards, the only choices I currently have to suggest would include these log racks: https://www.storeyourboard.com/6-sup-and-kayak-outdoor-wood-log-rack-freestanding-storage/They can withstand salt air environments and are freestanding and strong - holding up to 100 lbs per level. Those stands can hold up to 3 boards, and while they can be bolted to a surface, they also can also be used freestanding if you have a level surface to place them on; their material is marine grade starboard. There would be other alternatives if you had a wall to attach a rack to. Does this rack have to be bolted/ fastened to the floor? Or can it be free standing and still hold two kayaks and a stand up paddle board on it without tipping over? Unfortunately, this stainless steel rack system is not available in a freestanding version, and does need to be bolted to a dock surface. An alternative that works for both saltwater & freshwater areas outdoors, and is freestanding, is this log rack: https://www.storeyourboard.com/kayak-sup-and-canoe-one-sided-log-rack-fits-2-or-3-boats/. It can hold up to 3 boats/boards in the 3 level version, and is very strong - holding up to 100 lbs per level. If you aren't on or near salt water, or don't have salty air there might be some other freestanding racks we could suggest with 3 levels, but if you are in an area that requires marine-grade type materials, the log rack would be a good option with 3 levels. Can this be used as an indoor storage rack? just free standing against a wall? No, this SUP & Kayak rack will need to be secured to a surface such as a dock to be stable. There are alternatives that could work indoors, depending on what combination of boats and/or SUPs you are seeking to store, such as this freestanding rack: thishttps://www.storeyourboard.com/freestanding-sup-rack-for-6-paddleboards/or this one: https://www.storeyourboard.com/three-boat-freestanding-kayak-storage/which are both good choices for indoor storage. Will this hold three kayaks and two Sups? Yes, this stainless steel Kayak/SUP rack can hold up to five boards/boats, or a combination of up to 5 boards & boats -- so your 3 kayaks & 2 SUPs would be fine. The bottom/base level of the rack holds one boat, so you would need to order 2 sets of straight arms to hold your other two kayaks, and then 2 sets of angled arms to hold your SUPs. Can this serve as a free standing unit? I was thinking of setting it on the beach. Is that possible? No, this Kayak/SUP rack does not have a freestanding base or feet - it has to be mounted to a dock/pier surface. We have freestanding options here. I would prefer the uniformity of 4 straight arms. Is there any reason SUPs shouldn't be stored on straight arms? Also, I'm paddling in a salt water canal. The rack would be free standing under a carport away from the water, but will be exposed to salt on the boards. Would that work? To answer your first question: Some people prefer to store their boards on angled arms either for space reasons, and/or because some also prefer to store SUPs on their sides/rails because it applies less pressure points on the board. But storing a SUP on flat arms is always an option (we carry many SUP racks that store boards that way). You could customize this SUP rack to have 4 straight arms and that would work. Regarding your second and third questions: This is a Stainless Steel Rack that can be used outdoors and can be used in marine/salt environment, so that is not a problem - it helps to rinse boards off after use in salt water, but the rack should withstand that environment. However, it is *not* a freestanding rack. It uses feet that attach to a dock or pier, and cannot support itself freestanding -- so you would need to be attaching this rack system to some base like a dock/pier. Is this okay to have the rack free standing, and not mounted to a dock? The kayak/SUP dock does not work as a freestanding rack. It needs to be attached to the dock/pierr surface; it doesn't have regular legs to stand on, so won't work otherwise. I have 3 kayaks and 2 paddle boards to store. The paddle boards could be stacked on each other on the very bottom....so would I add 3 sets of straight arms for the kayaks? Confused on if that bottom part counts as 1 arm or not. If I had a 4th kayak, would this setup hold that much? For this dock/pier stainless steel rack system, the bottom level is considered a level that will hold a kayak - so if you were to stack your SUPs there, you would order 3 sets of straight arms for the kayaks. You could add another level for a 4th kayak, but the system maxes out at 500 lbs, with a max of 100 lbs per level, so that is something to keep in mind for your gear. Additionally, one can put the SUPs on straight arm levels - that is something of a preference, so you could put the stacked SUPs on a higher level of straight arms and keep the kayaks on the bottom. Last - if it is not clear, this is *not* a freestanding system, it does need to be mounted to something like a dock/pier or such surface. I am trying to configure a "Stainless Steel SUP and Kayak Rack | Customizable Outdoor Dock Storage" system with 2 sets of straight arms (for 2 kayaks) and 3 sets of angled arms (for 3 SUPs), just like the picture. I am getting the message "This arm combination does not fit this rack." Am I doing something wrong? For this customizable SUP/Kayak system, to get the rack as shown in the picture, for 3 SUPS (with angled arms) & 2 Kayaks (with straight arms) -- you only need to order one (1) set of the kayak straight arms. This is because the bottom level of the system is a straight arm set that holds the first kayak, so is built-in to the system. If you change the options you are choosing to 3 SUP angled arms & 1 Straight Kayak Arm set, you will be good to go for all 3 SUPs & 2 kayaks! How wide is each leg to be set apart? 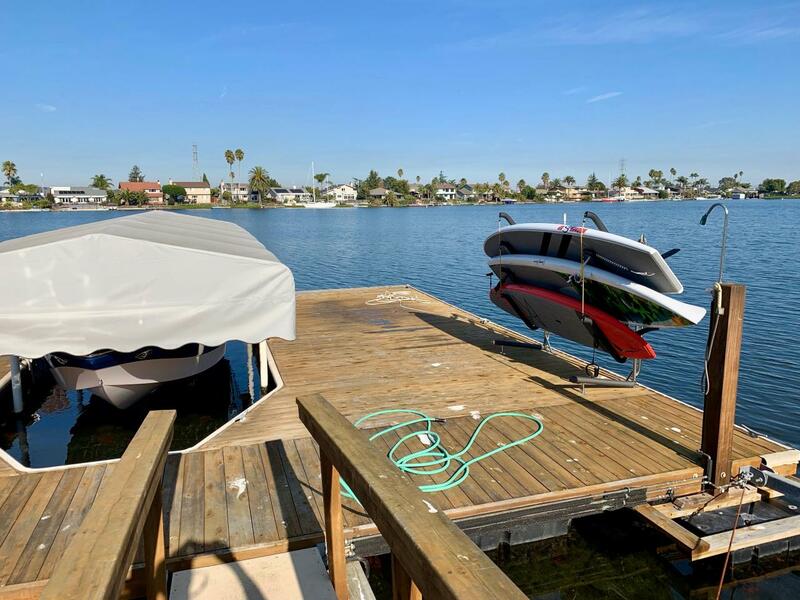 Each side of this customizable SUP/Kayak dock rack can be set as far apart or as close as you need them, to support your combination of boards & boats -- close enough that the shortest boards & boats will fit on each of the arms, but far enough apart that your longer boards/boats are adequately supported. You generally set them so that about so that about half the board/boat is between the arms, and 1/4 at nose & tail ends will be over the edges, but there is some play there - it can be 1/3rd of the boat in the middle, with 1/3rd on either end. You just want to make certain the length is distributed well, with not too much or too little hanging over the ends. What comes with the basic rack? From the pictures, it appears the lowest straight arms are part of the structure. So for storing 2 SUPs and 2 kayaks - total will required adding one more set of straight arms and 2 sets of angled arms? That configuration would give you a total of 4 levels to hold your two boats & two SUPs once in receipt! In several of the pictures it seems that the additional straight arms are longer than the base arms, is this the case? Yes, the straight arms on this Kayak/SUP rack are 36" long, which is a couple of inches longer than the base of the rack system. While that may seem a bit strange, the way the rack system is built and mounted to the deck, it works well; at about 33" long at the base the bottom kayak or boat still has more than enough support underneath it. Looking for a stainless steel marine grade quality rack that can be fastened to our dock which will hold a tandem kayak, 2 single kayaks and 2 SUP's. Would also be able to lock everything. This stainless steel rack should work well for what you need to store on your dock. It has a base level included, that would store one of the kayaks - the longest one (say the tandem if that is the longest); then you could order it with either 4 sets of additional straight arms, to have 5 levels total, to hold the rest of the kayaks and the SUPs. Alternately, you could order it with 2 sets of angled arms to hold the SUPs angled, and 2 sets of the straight arms. Again, that would get you a total of 5 levels with the bottom straight level. Either way would work, though angled arms are often preferred for SUPs, and would give you a little more room to adjust where they are on the rack. As to your other needs, it does mount to docks (it must be, as it is not a freestanding rack), and the mounting hardware is included. It is stainless steel, so can be used outdoors in a salt-water environment. For locking your boards, we recommend using the dock lock system: https://www.storeyourboard.com/sup-lock-system-dock-locks/ - it is a 10 foot long locking cable, that has a special jaw clamp used to attach to a SUP via the leash plug or fin box, and then that is secured to the locking cable; you can buy an additional jaw clamp to secure the second board to the same locking cable (you can secure several boards to the locking cable as long as you have a jaw clamp for each board). Those work great to secure the boards. Kayaks are a bit trickier to lock, but you can find some options to secure the boats here: https://www.storeyourboard.com/kayak-locks-and-safety.